Our Saturday paint-out yesterday was lots of fun. One of the artists in our group has mentioned that he and his wife have chickens and we were welcome to paint at his house. I've really been looking forward to it happening and it finally did! I've been painting gouache pieces lately because of the colder winter weather. 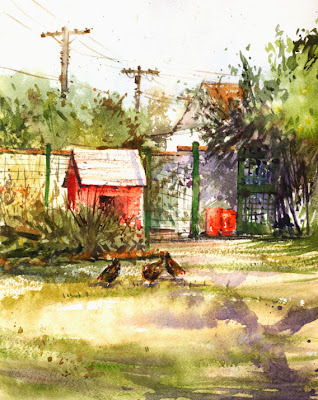 It was beautiful and sunny so I thought I'd get back to a plein air watercolor piece. Well, you know chickens don't hold still. Maybe they pose for a few seconds but that's it. They are so much fun to watch. I wish I had some chickens! 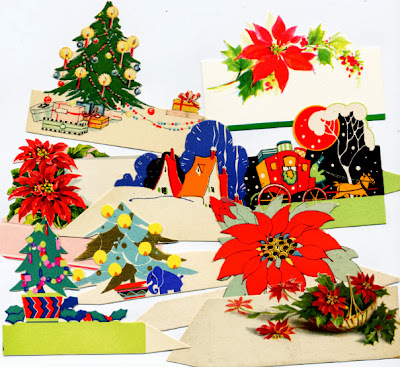 Wishing you all a Merry Christmas with some vintage holiday graphics....from the 1920's to the 1950's! I was looking forward to our holiday paint-out at Barbara's house again this year. 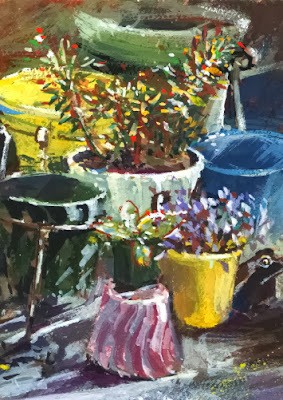 Barbara Field is the organizer of our Saturday plein air group and writes her blog What I See. 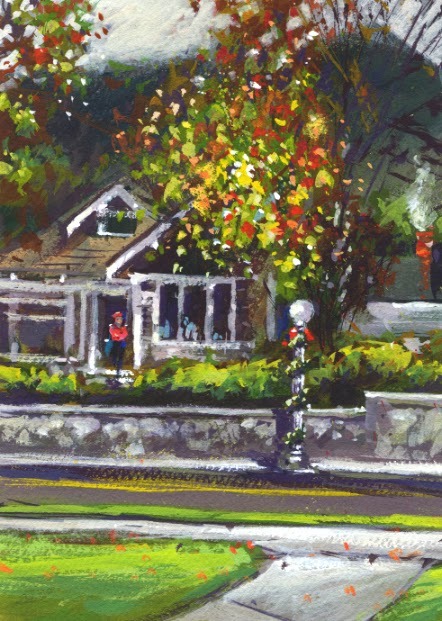 Not only does Barbara have some great ideas for places to paint, but she also invites us to paint at her house in December. It was a beautiful, sunny day for painting. 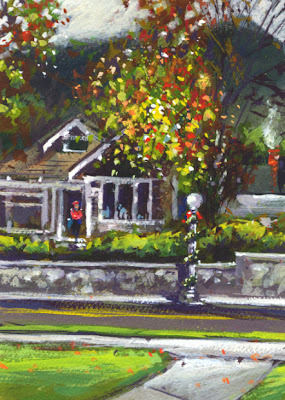 Last year I tried a gouache piece of the house that I posted in Holiday Paint-out! There were other painters I joined in the front then. 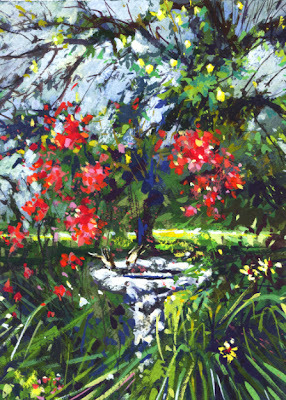 This year we were all in the back yard where I chose to try the bird bath in gouache. Barbara feeds birds and grows milkweed for monarch butterflies so her garden always has something happening. I had in mind to paint the milkweed since it's an interesting plant but it was in a different stage this December than it was last year. There were still some colorful caterpillars and even some monarchs in December. Looking forward to next year! 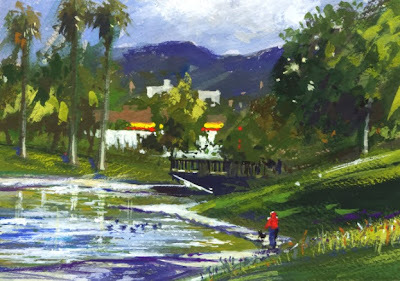 The Saturday paint-out group had a beautiful, sunny day for our paint-out in Hollenbeck Park. It was almost exactly a year ago that we painted there, my first time, and it was a dreary day with sprinkles just holding off. I posted that watercolor in Hollenbeck Park. It's an old park near downtown Los Angeles and very busy on Saturday. I don't remember the resident flock of pigeons being so large last year. Some visitors were feeding them and they came up to us painters to see if we had some pigeon food. Besides pigeons, since there is a lovely, long lake of course there are lots of ducks and even cormorants. I decided to try a gouache piece this time. I added just a few of the many birds. 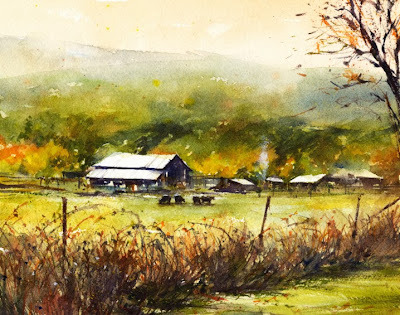 While working on my last blog post about Vinita Pappas's online watercolor class Create 38, I realized I haven't posted two of my favorite paintings. These watercolors were both painted for the online class. 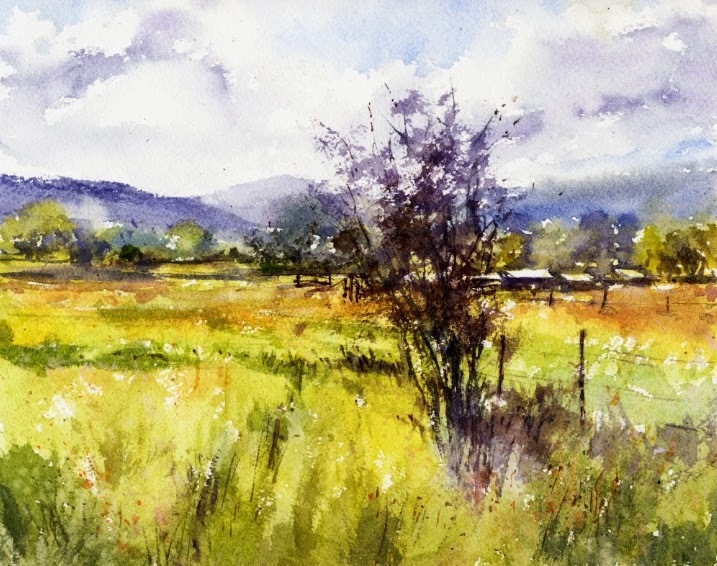 The rural views that Vinita has near her in Oregon are so appealing to me to paint. The first piece below of an Oregon field is a recent one and a favorite. It was fun to paint and I think it was successful. 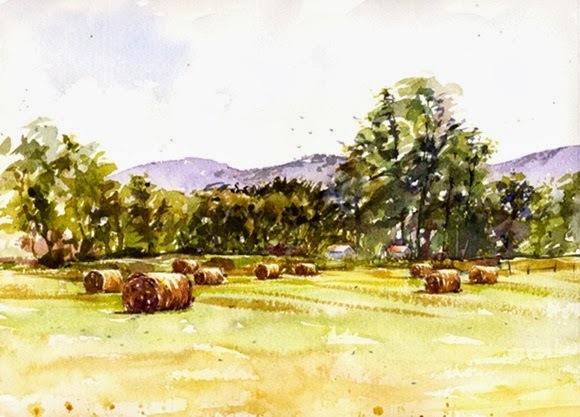 The piece below featuring hay bales was also rewarding as well as a challenge. My first try at hay bales! I find a lots of inspiration as well as challenge in these views. Next I need to see this beautiful area in person! It's December, I know... In the Create 38 online watercolor painting class, taught by Vinita Pappas, we just finished a neat challenge for November. Each member could submit a piece that represented something about themselves and their lives. Vinita posted all the submissions in an online exhibit titled One November Day, complete with a worldwide map and a pin for each member who submitted a painting. It was fun to see what each person chose to paint, and of course where we are all located. I was stumped over what to paint for my submission until I was out in my backyard moving plants. Oh! my colorful California pots planted with warm-weather succulents that I like would be fun to paint! I took my gouache outside to paint some pots, and added a ceramic garden frog that happened to be peeking into the scene. In November, Vinita also posted a watercolor demo titled Glenbrook Barn which we could try ourselves. I always love Vinita's demos and tips. This was the first time I tried adding a wispy puff of smoke or steam. And I always love painting barns and cows since they aren't plentiful subjects in my area. I had fun with these two pieces. On Friday one of the paint-out groups met at the L.A. River. I've painted there twice before and posted two pieces in L.A. River. My watercolor from another visit is waiting for me to finish. 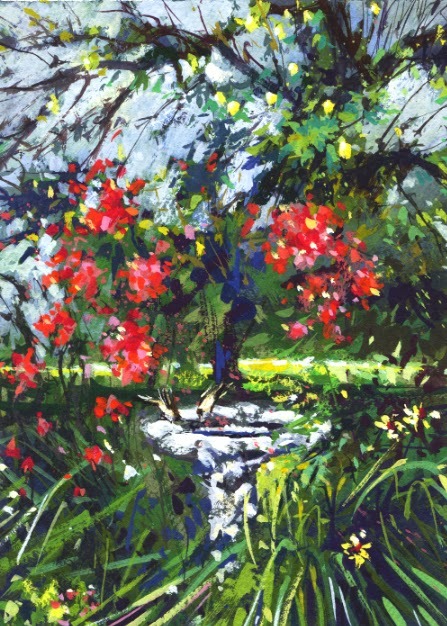 Our location next to the river was "downstream" from where I painted before. At first I didn't think the views were as plentiful as the other spot. But then I noticed a stunning view of the Griffith Observatory, far away on a hill in Griffith Park. The day had sun glancing through clouds and when I spotted the Observatory the light was shining brightly on it. Wow, no reason to look any further for my subject. One if my very early plein air paint-outs (just last year!) was at the Griffith Observatory which I blogged about in Space! What an exciting day that was. Last Friday at the LA River it was just the opposite...very relaxing painting next to the river with friends. Well, there IS a busy freeway just across the river. 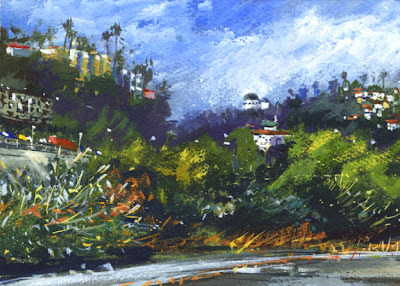 I decided to do a small gouache piece thinking I'd like to use it for all the details in the scene like plants and trees by the river, structures on the hillsides, and the freeway. I had fun painting this piece and I was happy to be able to include the Observatory. The Saturday paint-out group recently painted in Sierra Madre at the Memorial Park. There are mountain views, as well as some interesting homes and churches to paint in the neighborhood surrounding the park. That day we all chose views to paint from the north east corner of the park. It turned out that it was the Saturday morning for the crew to decorate the sidewalk lampposts with holiday garlands, topped with red bows. I chose a home across the street to paint. There was a pretty tree with some fall colors and I wanted to include one of the holiday lampposts. Since the morning was cold and a little dreary I decided to use gouache since it dries faster than transparent watercolor. I still went to the car once to use the heater to dry the first stage of the painting. I planned to add a figure to the piece but couldn't decide where to put a person walking on the sidewalk. I had a suggestion to have a person in the doorway of the house. I went with the idea and added a lady leaving to go shopping for the holidays!